This is the manual part were we are doing a next, next, I agree walk-through for all of you that are new to Citrix XenApp / XenDesktop or want to see what changed in the installation from previous versions. You can install Citrix Licensing in two seperate ways and you will see that the installation dialogs and the Control Panel entries will look differently after installation depending on which way you choose. Check http://docs.citrix.com/en-us/xenapp-and-xendesktop/7/cds-license-landing-/lic-licensing-prerequisites.html for specific prerequisites. Let´s start. Insert the XenApp_and_XenDesktop_7_13.iso in your VM and double click on your DVD drive. Now click on the “Start” button in the XenApp field. There is no huge difference wheter you choose XenApp or XenDesktop, the infrastructure components are the same. Now choose Citrix License Server on the left lower side in the Extend Deployment area. The installer look changed a little bit from the earlier versions and there is some room on the righht side for more options to come. Accept the License Agreement and choose NEXT. If you want you can change the installation directory you can do it here. I will install the License Server in the configured folder. Always read the small letters in installers and readme´s, it could save your life ;-). The installer states that you shouldn´t install the License Server and Citrix Director on the same system for scale and performance reasons. In the next step you can change the option to configure the firewall automatically or do it manually later. If you don´t need the settings because you are not using the Windows firewall choose manually, I will choose automatically in my lab. The next screen shows you a summary of your configured settings. The installation starts after you click INSTALL. After some time the installer quits successfully. You now have a running Citrix License Server. Click FINISH. Yes, that was hard. You have successfully installed the Citrix Licenser Server. Let´s see how this looks like in Programs and Features. You can see that Citrix XenDesktop 7.13 installed. What I really don´t like at this place is that we cannot see what excactly is installed. The name of the component simply stated Citrix XenDesktop 7.13 and not Citrix Licensing as I would expect. It would be easier if there was something like “Citrix License Server” or something similar. You can see a totally different behaviour in the installation dialogs and the Control Panel entry. Let´s move on. Choose the install location and click NEXT. Configure the ports and if you like let the installer set the Windows Firewall exceptions. NEXT. If you like you can configure Citrix Licensing to automatically check for Subscription Renewals. Click INSTALL. That´s it. Click on FINISH. If you know check the entry in Control Panel you can see “Citrix Licensing with a product version of 13.0.0.19005. The safest way to check for the really installed version of Citrix Licensing is to check the registry entry for it. Because the Citrix Service Provider program requires Customer Experience Improvement Program (CEIP) and Call Home, if you are a Citrix Service Provider, you cannot disable CEIP or Call Home. That´s it for the manual part of the installation. This blog post is part of a series covering the installation and configuration of Citrix XenApp 7.13 on Windows Server 2016. This is the manual part were we are doing a next, next, I agree walk-through for all of you that are new to Citrix XenApp or want to see what changed in the installation from previous versions. Today we are going to install one prerequisite that we need for our Citrix environment – Microsoft Remote Desktop Services Licensing. In smaller environment I typically tend to install the Microsoft Licensing component on the same server as the Citrix Licensing Server. The bigger the environment the more likely you will have separate systems for infrastructure component installation. Clustering RD Connection Broker servers on RD Virtualization Host servers. An active-active RD Connection Broker installation. To install it you need to switch to the Servermanager and start the Add Roles and Features Wizard. Click NEXT. Choose Role-based or feature-based installation. Click NEXT. As we are on the server were we want to install RDS Licensing click NEXT. In the next screen scroll down to Remote Desktop Services and place a checkmark left to it. Click NEXT. In the next screen leave everything untouched. Click NEXT. Now place a checkmark left to Remote Desktop Services Licensing. Click Add features in the opening window. In the next screen click NEXT. Everything we need is now selected and ready for installation. Click INSTALL. You can watch the progress if you like or grap a cup of coffee ;-). But be quick it won´t take long. After the installation finishes click CLOSE. And for today we are finished with this installation-quicky. I hope this blog post helped you a bit. In a later one we will configure RDS Licensing. Have you ever heard of DevOps?… No? Honestly this could mean a lot, and from my opinion it’s still quite vague. You could ask ten other people and end up with ten different definitions. I think DevOps can be explained simply as operations working together with engineers to get things done faster in an automated and consecutive way. Be patient now. The whole process can take from 3-5 hours! 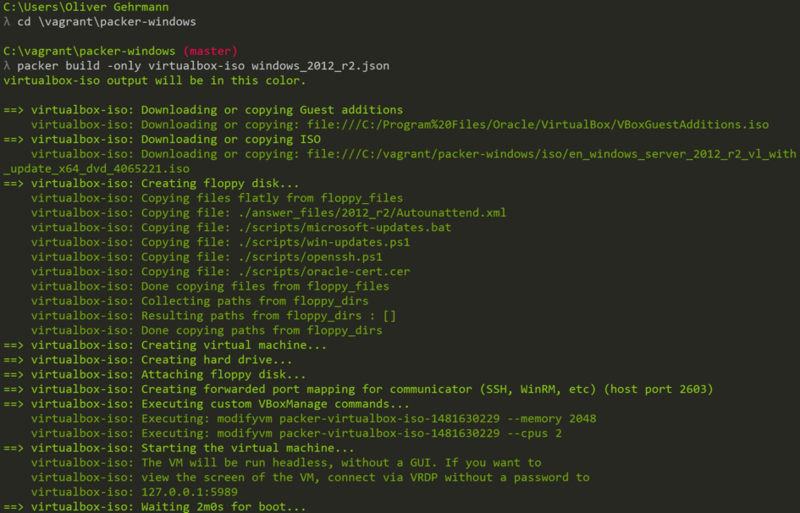 Afterward, you will find a windows_2012_r2_virtualbox.box file which can be used with vagrant. The tool will compute the md5 checksum of the ISO which you have to use in your .json file. If you don’t have a volume license ISO, you also need to set the Product Key. For that open the answer_files/2012_r2/Autounattend.xml file, search for ProductKey and follow the instructions. If you are going to configure your VM as a KMS client, you can use the product keys at http://technet.microsoft.com/en-us/library/jj612867.aspx. These are the default values used in the Key element. Add the created box file to Vagrant. This will also take a short amount of time. 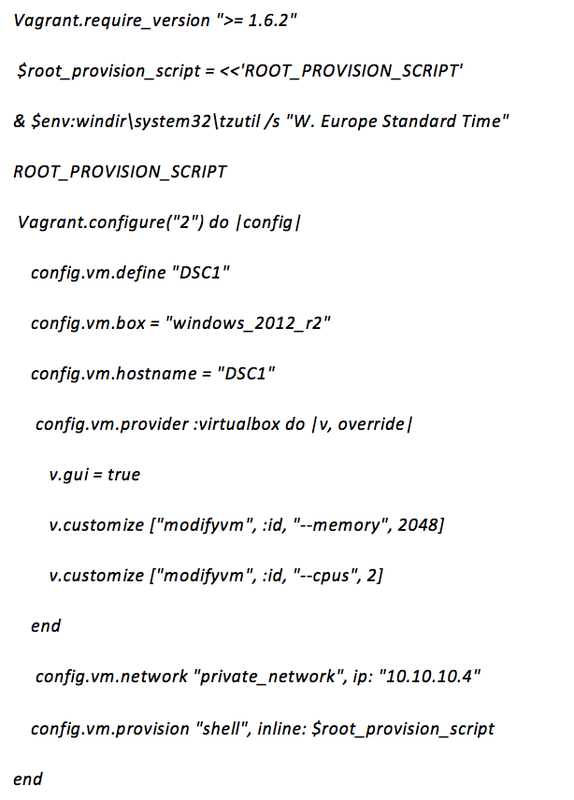 To start the server with vagrant you need a provisioning script with the final provision. Shortly after, you can connect to the box via vagrant rdp (Username: vagrant, Password vagrant). Halt the box with “vagrant halt” or destroy it with “vagrant destroy”. A new box can be built again within seconds, just use “vagrant up”. That’s it! Enjoy your new, reproducible and lightweight windows environment. Big thanks to Joe for providing this awesome Github repository! Great work. Hi and welcome to this second part about troubleshooting Citrix XenApp. 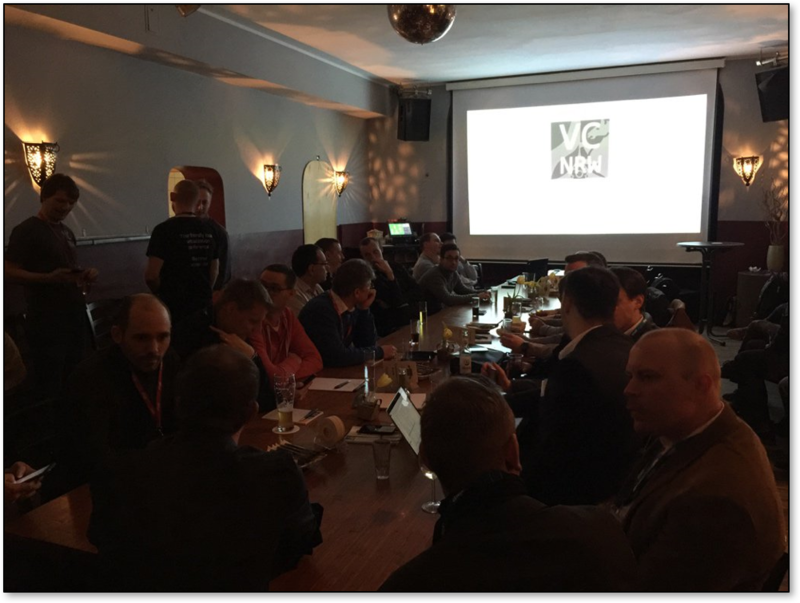 Last november I had the honor to speak at two well known EUC and Citrix events. First of all at E2EVC in Rome, Italy and the day after at DCUG TecCon in Kassel, Germany. The topic of both sessions was “Troubleshoot XenApp with Style”. I am writing this blog for all of you that couldn´t attend one of these great conferences. The third part will cover general troubleshooting tools that didn´t fit in the session and part 1 and 2 of the blog series. Hi and welcome to this first part about troubleshooting Citrix XenApp. 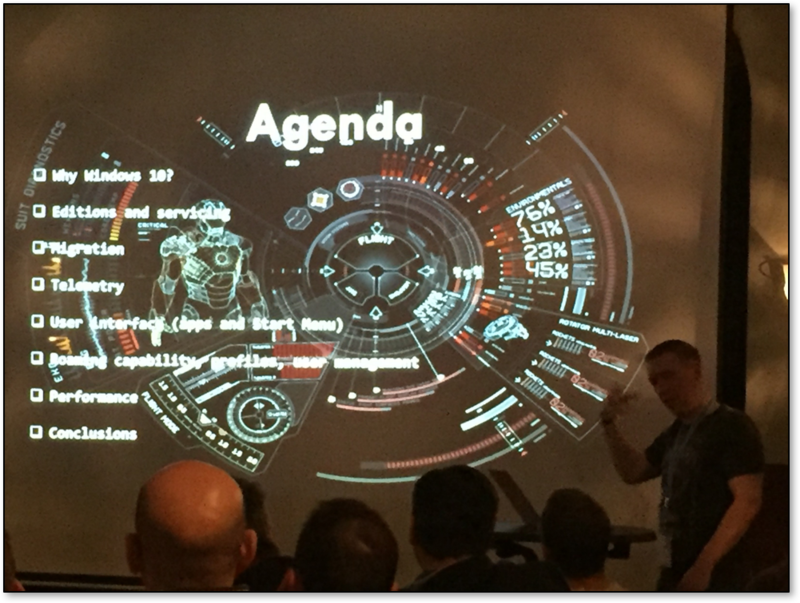 Last november I had the honor to speak at two well known EUC and Citrix events. First of all at E2EVC in Rome, Italy and the day after at DCUG TecCon in Kassel, Germany. The topic of both sessions was “Troubleshoot XenApp with Style”. I am writing this blog for all of you that couldn´t attend one of these great conferences. This first part is about the Citrix tools because otherwise it would grow too big if I would integrate all parts. The second part is about some of the Microsoft tools. The third part is about general troubleshooting tools that didn´t fit in the session. This post is not about the usual problems you might have with Certificates, Firewalls or similar things where you might be able to find an answer googling around or checking the knowledge base. Unter diesem Motto luden die Organisatoren Timm und Helge zur ersten VCNRW im Jahre 2017. Wieder einmal war das Event VCNRW super organisiert und erfuhr eine hohe Nachfrage durch die Teilnehmer. Die Referenten des Abends waren Rainer Kodat mit dem Thema „Mit WEM geht’s schneller?! – Optimierung der User Experience“ und James Rankin mit dem Thema „Windows 10 – Answering the Enterprise Deployment Questions“. Der Vortrag über den Citrix Workspace Environment Manager thematisiert die User Experience von Endanwendern in Virtualisierungsprojekten. Ziel ist es dem Endanwender eine gleichbleibend gute User Experience zu bieten. Rainer zeigte uns in einer Live Demo wie das CPU- und RAM-Balancing funktioniert. Des Weiteren besitzt das Produkt einen Log-on Accelerator, welcher z.B. das Mapping von Netzlaufwerk parallel anstatt seriell ausführt. WEM basiert hierbei auf einem Service und verzichtet gänzlich auf Filter Treiber. Nach einer kurzen Pause began James Rankin mit seinem Vortrag. Kern waren die Erfahrungen und daraus folgende Kenntnisse von James im Bezug auf das Windows 10 Deployment im Corporate und Enterprise Umfeld. Der Beitrag beantwortete Schlüsselfragen zum Deployment und gab hilfreiche Tips für nachfolgende Tätigkeiten und Prozesse. 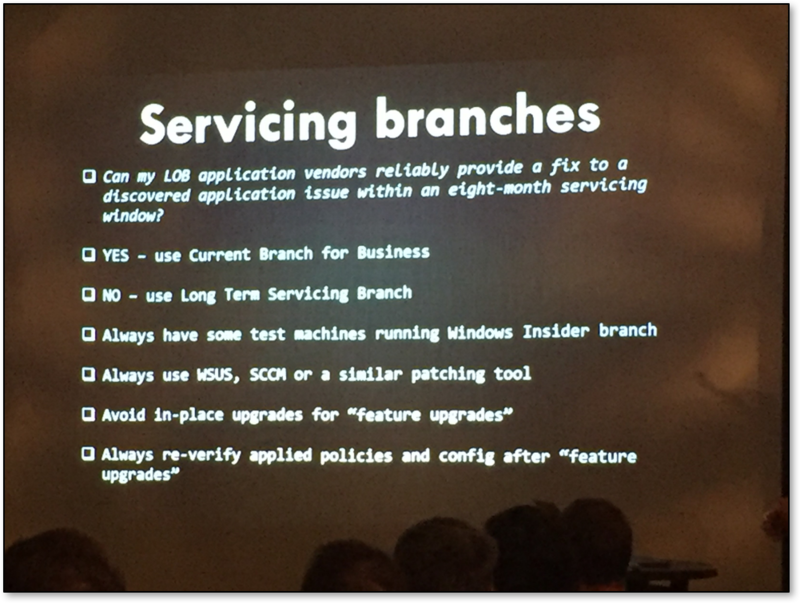 Besonders detailliert wurden die Vor-und Nachteile der zahlreichen Windows 10 Branches dargestellt und die daraus resultierenden Update Szenarien. Im Fokus stand weiterhin der Umgang mit Modern Apps in Windows 10. Entsprechende Ratschläge und Erfahrung von James aus seinen Projekten zu diesem Thema sind besonders hilfreich für eigene Projekte. Wir haben die Vorträge mit Spannung verfolgt und freuen uns bereits auf das nächste Event am 27.04.2017. Wir werden auf jeden Fall wieder teilnehmen! Ein neues Schreckgespenst kursiert seit einigen Tagen wieder durch die IT-Abteilungen dieser Welt. Vor Monaten hieß es Locky, zwischenzeitlich Petya, CryptoWall, CTB-Locker oder TeslaCrypt und nun fällt ein neuer Name in den Kaffeepausen der Unternehmen: Goldeneye. Und genau wie die im Orbit stationierte, namensgebende EMP-Waffe, gegen die Pierce Brosnan, bewaffnet mit P99 und erschreckend-statischer Fönfrisur, im gleichnamigen Bond-Streifen kämpft, setzt das Ransomware-Pendant die IT aktuell flächendeckend matt. Wie alle Vorgänger verbreitet sich Goldeneye rasant, unbeeindruckt von den eingesetzten Virenscannern und anderen Schutzmaßnahmen. Wird ihre Projektkommunikation von E-Mails, PowerPoint Präsentationen oder Telefonkonferenzen bestimmt? Informationen werden nicht effizient verarbeitet und kommuniziert? Hauptsächlich wird unter Kommunikation nur Informieren und Motivieren verstanden? Der Stellenwert der Projektkommunikation für die tatsächliche Umsetzung der Projektziele und somit den Projekterfolg wird unterschätzt? Sie wollen diesen Umstand ändern, sind sich des grundlegenden Problems aber nicht vollkommen bewusst? Nachteil dieser Kommunikationsformen und Praktiken ist, dass diese jeweils nur ein einzelnes System – das visuelle oder auditive – ansprechen. Missverständnisse, Informationsverlust und daraus folgender Mehraufwand sind nur einige Folgeerscheinungen. Eine entsprechende Studie zur Projektkommunikation von Cetacea Communications & Public Relations in Kooperation mit der Deutsche Gesellschaft für Projektmanagement e. V. (GPM) und Atreus Interim Management befasste sich mit der Rolle von Kommunikation innerhalb und außerhalb von Projekten und einer ersten umfassenden Bestandsaufnahme aus Sicht von Projektmanagern (nähere Informationen zur Studie unter https://www.gpm-ipma.de/know_how/studienergebnisse/projektkommunikation.html). In der Praxis ist Kommunikation in und von Projekten immer noch ein Lippenbekenntnis. Ihr kommt keine angemessene Rolle zu und sie wird nicht professionell genug umgesetzt. Am 2016-09-15 fand bereits die 7. 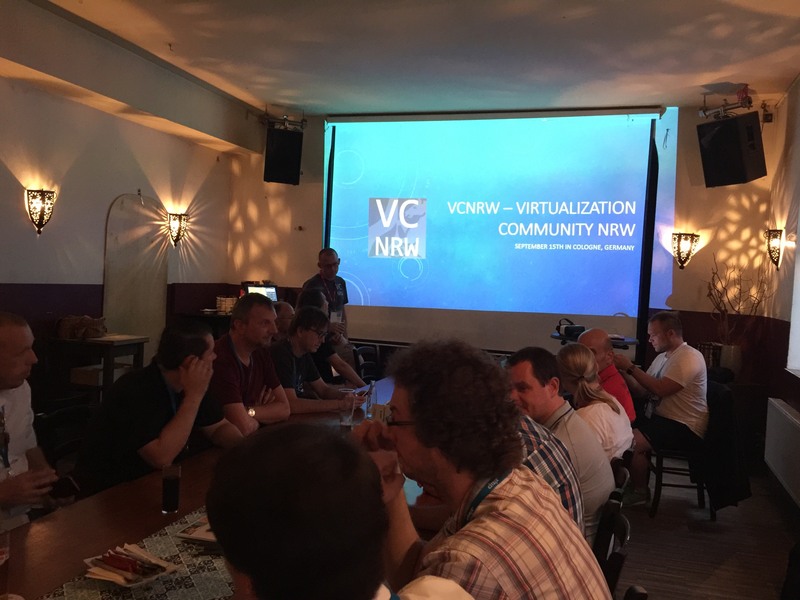 Veranstaltung der „Virtual Community NRW“ (VCNRW), erneut durch einen super Job der beiden Organisatoren Timm und Helge, statt. Bei besten Wetter und einer lockeren wie herzlichen Begrüßung von bekannten wie neuen Gesichtern und einer tollen Stimmung, nahmen Christian, Joanna, Sinisa und Martin von der RISC teil. Dann startete bereits der erste Vortrag von Daniel Neumann zum Thema „Providing test environments in Azure using Azure DevTest Labs“.